Disclosure: This post contains an affiliate link, all opinions expressed are my own. Thank you for using my links, it helps tremendously! There’s a trick I’ve used to save HUGE amounts of money when staying at Walt Disney World; renting DVC points. This will be the first of a 3-part series on the blog. Not everyone knows about renting DVC, and those who do often have a lot of misconceptions. In this series we’ll explore all the pros and cons and hopefully answer any questions you may have. Now, before we get any further, renting DVC carries some risk. This is particularly true if you decide to negotiate your own terms. You’ve got to research the topic thoroughly, ask for references, and do your homework. This includes sources outside of this blog. Reservations are also typically non-refundable and non-exchangeable. So, you have to be certain of your dates, and be willing to accept some risk. However, when successful, the payoff is big time. DVC stands for Disney Vacation Club. This is a timeshare offering from Disney. You’ll often see kiosks at the park promoting this real estate venture. What is a DVC rental? Rent from an existing DVC member rather than making a reservation direct through Walt Disney World Resort. The room is the same, but the price is very different. It’s important to note that when you rent points, the reservation remains in control of the DVC member. Disney is not involved in any way. In most cases reservations are non-refundable and cannot be changed. Why would a DVC member want to rent to me? There are lots of reasons.. The economy, not being able to travel to Disney World during the specified time frame, or wanting to visit a non-Disney destination. It turns out to be a win-win for both parties as a DVC rental costs less than direct reservations, and DVC members have costs of membership covered. How is the timeshare valued? Disney uses a point system, rather than a specified week as in most traditional timeshares. A room’s value is determined by size, location, day of the week, and season. Owners buy a certain number of points to cover their vacations. Check out a point chart at WDWInfo. 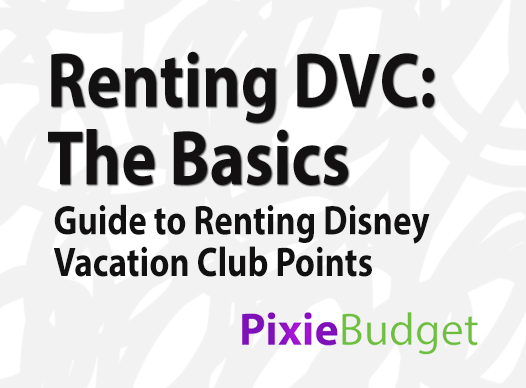 When renting DVC, you’ll pay per point. Typically you’ll pay in the vicinity of $14 per point. So, a studio at Saratoga Springs Resort for one week during the Adventure Season (the cheapest) requires 90 points, this would translate to $1260 or $180 per night. Taxes are included in the per-point rate, so you won’t need to tack on anything additional. This is a HUGE savings, as rates for Saratoga Springs are starting at about $318 per night through Disney. Please do check rates for your particular dates, as pricing can change quickly. When does renting DVC make sense? If you’re already looking at a moderate, deluxe, or deluxe villa category resort, your dates won’t change, you feel comfortable making a non-refundable reservation, and you’re willing to take a little chance. Moderate resorts are sometimes cheaper direct through Disney when using a promo code or other discount. Check to see if this applies to your dates. If not, you may get a significant room upgrade for a similar rate. Value resorts are almost always cheaper than renting points. If you’re doing a vacation on a small budget, a value resort direct through Disney will be the way to go. What is the risk with DVC rentals? The risk is that your reservation is held by another individual. It requires some trust that the person will do what they say, and not take off with your money. This risk is somewhat reduced when using an agency. Think of an agency as a real estate office. They bring the buyer and seller together to make a transaction. The agency facilitates the transaction, and makes a small commission from the sale. But, the contract is between the buyer and seller. The commission is usually included in the price per point. In an individual negotiation, you find a member willing to rent points, typically on a message board. You’ll then negotiate the terms of sale. Yes, you will probably pay less than at an agency, but the risk is significantly higher. You don’t know the history of the person posting, and they could be shady.. or not.. you just don’t know. Do not attempt this type of transaction without doing your homework, and understanding of all of the potential risks and pitfalls involved. We’ll explore both types of DVC rental in future posts. When can I make DVC rental reservations? It depends on the DVC owner. Members can make reservations at the resort they purchased (also called a home resort) 11 months in advance. They can make reservations at all other DVC resorts 9 months in advance. Popular dates reserve quickly, particularly during holidays. Be aware that you may not be able to reserve the exact resort you want during heavily traveled times or at last-minute. Which resorts can I stay? What is included in a DVC reservation? Most villas include a small dinette, microwave, mini-fridge, coffee maker and toaster. Some villas include a stove and pots and pans. DVC reservations include all of the perks of staying at an official Disney resort like extra magic hours, package delivery, free parking, Fastpass+, and MagicBands. Disney’s Magical Express (free airport transportation) is available, but will need to arranged for by the DVC owner. If you’d like a dining plan, this too can be added. What is not included in a DVC reservation? Daily Housekeeping. You can expect daily towel service, but housekeeping typically services your room on the 4th day. You can add daily housekeeping for an additional fee. We’ll explore more about renting DVC in future posts. Was this helpful? Have you rented DVC points in the past? Let me know in the comments! This is an excellent post! You’ve explained the process and its advantages so well. We’re DVC members who have leased out our extra/unused points before (through David’s) and I can tell you from this side of the transaction, David’s company is excellent and easy to work with – they provide great customer service no matter which side of the transaction you’re on. What a great post! I love how you broke everything down. It answered several of my questions about possibly renting points. Thank you for linking up at Travel Tip Thursday! Hope to see you again this week.